Munch On Me is a daily deals site for food. But wait, before you click away to a slideshow about hot coders, Munch On Me (Y Combinator Summer class of 2011) has got some features that might just reroute you from relying on the big G for your munchies back to its sweet sweet embrace. First of all, Munch On Me focuses on giving discounts on specific dishes, instead of on anything in the entire restaurant. Any business who’s been a victim of the Groupon effect knows why this is important, namely because restaurants can prepare for the demand in advance, overloading on the inventory they expect will sell out. The Munch On Me discount focuses only on one item, and restaurants can upsell after the initial sale (“Would you like fries with that free milkshake?) and can keep offering up deals. Customers can redeem their deals immediately, a food industry-specific convenience that Groupon seems to have caught onto with its Groupon Now concept. Because it takes less of a cut than Groupon, Munch On Me can get merchants to give out larger discounts as well as items for free in hopes of bringing more people into the store. Munch On Me also has another, more unique competitive advantage to Groupon. Banking on the fact that restaurants can’t take stellar pictures of their own food (food pics are a big deal), it sends out a professional photographer to get the job done. 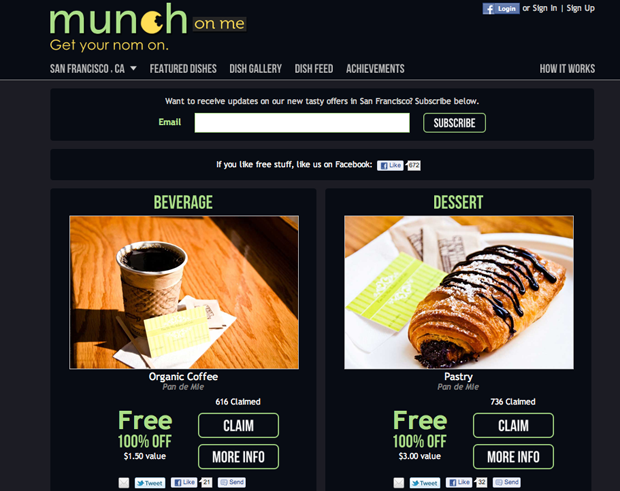 You can currently peruse 2-4 Munch On Me deals a week in San Francisco and in Berkeley.